I am Ben Akhtar – Aged 15. Although I am young – I am already living my dreams in the world of extreme sports. Since as long as I can remember I have always been fixated by flying, aviation. From the age of 8 I was already designing/creating my own 7 Cell BASE canopies, 3 ring release systems for rock climbing use, along with paragliding wings and petrol planes that were bigger than me. I was always outside, looking for the next adventure. Growing up, I was surrounded by the aviation world, close to an airport and walking on the North Downs capturing glimpses of Paragliders. It was at this time I knew that all I was ever going to do was fly – and that alone for the rest of my life. 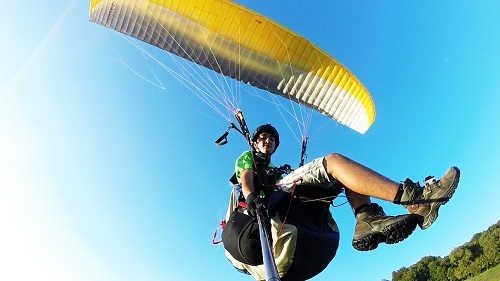 I began training in paragliding just one week after my 14th Birthday, with the Green Dragons Hang Gliding and Paragliding Centre, after an agonising wait before becoming old enough to begin. It was the most demanding and rewarding experience I could ever imagine, however a huge hurdle. Financially I worked and saved for months, even selling personal items of the past to fund two separate courses – It was all funded by me. It was hard, I’ll be honest, particularly for someone so young, slaving away all my spare time to scrape fees together, however my determination and drive pushed me on throughout. I knew where I wanted to go, and what I wanted to do – the end goal. Nothing meant more to me in my life, it was pure dedication and dead straight focus. 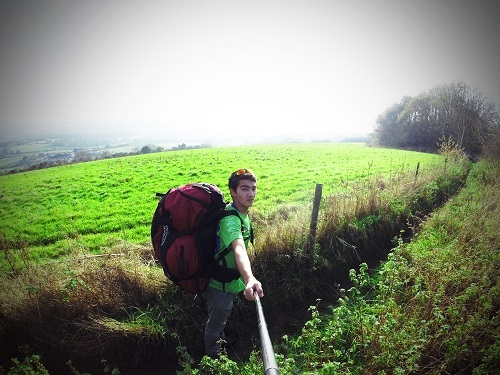 Qualifying in November 2013 after 11 months of training, I became the UK’s youngest paraglider pilot (14), featuring in the governing bodies ‘Skywings’ magazine, which went out to around 7000 pilots in the UK. This was my first major achievement and I felt all my hard work had paid off. Since then I have been completely hooked, flying whenever the weather allows. I’m only truly living when I’m in the sky, all the rest of the time is simply waiting to get back up there. Nothing beats the silence, the feel, the rush of being in the moment. Nothing else matters. Being in tune with the air and your wing is a privileged feeling, and it really makes sense as all actions become instinctive. To know you are experiencing things only a handful will in their lives makes everlasting memories, and it is humbling to be able to do so at such a young age. Since then I have talked to numerous paragliding manufactures and teams, and have got a lot in the making going on I am pushing for. Also, being sponsored by the Green Dragons has really helped me out, and it’s thanks to them for drilling the core instinctive roots of flying that makes me such a safe pilot – you react without thinking, mentally and physically prepared for any scenario by an excellent team, with world class safety – Led by CFI Andy Shaw – who has shown me no end of support and guidance that makes me the pilot I am today. 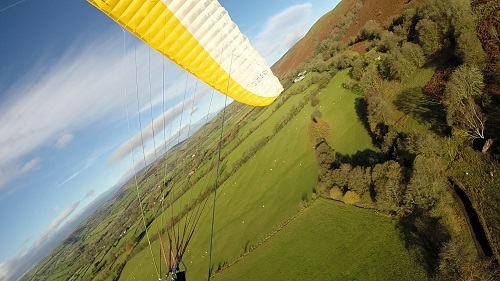 I have just returned from competing on the UK Accuracy Paragliding team in Wales, and hope to represent the UK in numerous airborne sports in the future. Next year I am beginning training in skydiving as soon as I turn 16, aiming to complete the AFF course immediately and begin the journey into a new skill. This is a major step for me, as it acts as the foundational link to BASE jumping and eventual wingsuit flying in the future. 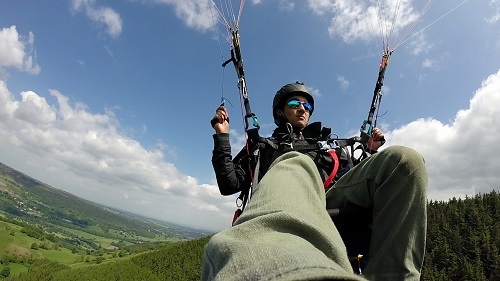 As well as the above, I am packing in speedflying (a fast paced discipline of paragliding), as well as training in paramotoring in the next few weeks, with a Stunt Promotional plan for next year with a leading manufacture! I love to get in the air in any way, and so I am also days away from training for my Private Pilot’s License at Biggin Hill Airport. I am into all the xtreme sports and have dedicated my life at such a young age to become the best there is, I hope to make a career out of such airborne sports, I live to fly. 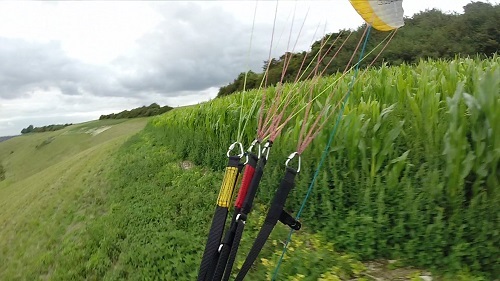 Paragliding has risks, just like any aviation related sport. However, it is accepted, and learning to manage these risks to the best of your ability makes the difference – using all of your theoretical knowledge to understand what you are flying and how it reacts. With this, reactions become instinctive, and you tune into every action and reaction, the wind runs through you and a wing becomes an extension of your body. Simple as that. It’s a feeling like no other, unparalleled. I live and breathe flying – when asleep, I dream it. Risk and fear are key parts of life, however they can also easily slip into controlling your actions – your life, and the path to success in what you want to do. It can be both a limitation and accelerant depending on how you deal with it. I have one life to live, and I plan on ‘living’ not just ‘existing’. At the end of the day I want to encourage and inspire others to do what they want to do, what they love doing – whatever it may be! I hope to act as living proof that you can achieve your dreams at a young age, as long as you have the vision, the drive, passion, determination, and willing to shed blood and sweat to get it. I have funded all of my training and continue to do so, running my own company and selling all of my belongs to afford kit and training, which Is why I am proud my hard work has worn off to make me one of the youngest extreme sports athletes in the UK. I see myself as an up and coming youngster in the vast world of the extreme adventure sports, and hope to become the best there is in my 20’s. I always strive for perfection, and it is this obsession of detail that helps me to always better and further myself, whatever I am doing. I feel lucky that I have the opportunity to dedicate my life to something meaningful, putting in all I have. One of my strong beliefs is “Dreaming Big – Living Big from the start”, and to “Do what you Love doing”. I am now pushing out for as much support and help I can get. Financing training and gear is a never-ending struggle for me, trying to ‘gain a name for myself’ in the industry, there is never a moment that I am not sending off emails, calling people and pushing to make things happen, after all, the future doesn’t wait for anyone! I enjoy creating lots of media and film edits to showcase the support and ‘what I get up to’, check some of it out if you are interested. Fly Far, Fly High, Land Safe. This entry was posted in Air Sports, Base Jumping, Featured, Hang Gliding, Paragliding, Sky Diving and tagged Air Sports, Base Jumping, Ben Akhtar, Extreme Sports, Paragliding, Sky Diving. Bookmark the permalink. © Copyright 2011 - 2017. All Rights Reserved.